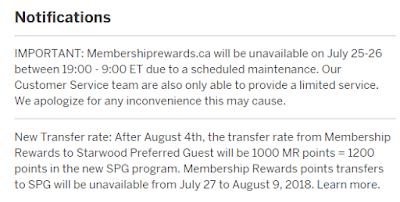 As of Aug 4, 2018, the current transfer rate of 1000 AmEx MR = 500 SPG = 1500 Marriott will end. The new transfer rate will be 1000 AmEx MR = 1200 New Marriott. It is almost 20% decrease, but still better than what we expected before (we thought AmEx may change the rate to 1:1 before). Base on this new rate, I think AmEx Cobalt Card will still be a very good card to earn Marriott points after Aug 2018. 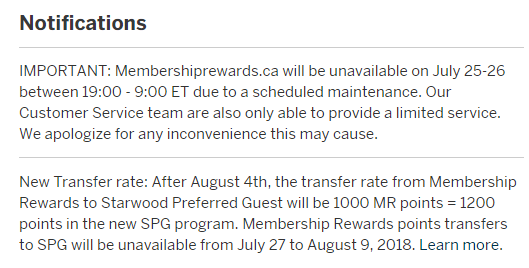 If you have enough AmEx Cobalt MR points, I suggest you to transfer them into SPG before Jul 27. Because you will not be able to do the point transfer from Jul 27 to Aug 9, 2018, inclusive.